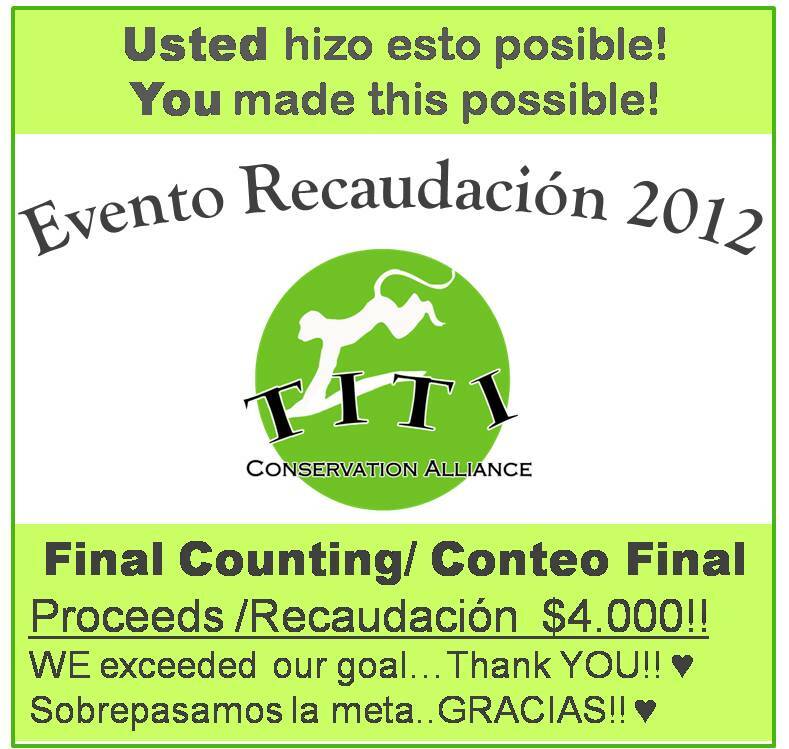 Titi Conservation Alliance would like to thank all those who came and support the 2012 Annual Fundraiser at Gaia Hotel & Reserve. Thanks to all of you, the evening’s proceeds reached $4,000, exceeding the initial goal that the Alliance had set for the environmental education program. Beyond having such a great audience, we are happy to recognize that it was definitely a successful night with delicious gourmet appetizers and great people. The live music with Pura Bossa, Gaia´s musicians and the last-minute Argentinean friends from Drake Bay, filled the air with vibrant sweet and playful tunes that positively surprised us all. And for the first time, we must say that the organization pushed everyone towards deforestation…by the end of the night, the donation tree had no more donation leaves left! A famous quote says “The important thing is not so much that every child should be taught, as that every child should be given the wish to learn.” Here is a simple question: How many special classes and teachers inspired your life? Was there any course you loved so much you didn’t want to miss a lesson? Time is precious and titis know it, here is a quick review of our latest results. We welcome El Pasito school to our program. Believe it or not, is the 11th incorporation so far. We recently had the pleasure of sharing with a group of “Discovering Deaf Worlds” who visited us to learn more about TCA´s work and our destination. Thanks for coming guys! Vanderbilt University chose TCA again to help students experience a reforestation day and share with a community within the Rio Naranjo Biological Corridor. Three nurseries located in the schools of Ma. Luisa Castro, El Estadio y República de Corea have been finished, and three more are on their way. TCA recently did the first two scholar field trips of 2011 with El Estadio and República de Corea schools. All of our 11 schools will enjoy this experience. Never stop learning, TCA brings several workshops. Titi Conservation Alliance is concerned by the education of children and adults alike. For our kids we have the Environmental Education Program and for our members and local businesses we have our annual series of workshops. Workshops for this year kicked-off last month with the first activity “Intelligent Wastewater Management. Practical Solutions for Businesses in Quepos.” The lectures were provided by Responsabilidad Ambiental Corporativa (RAC), a pioneer company in environmental management and present provider for biodegradable products in CR. The workshop concluded successfully, giving the opportunity to participate without any cost to more than 15 local businesses. Having the tools and practical solutions to improve wastewater management is today a reality. 1. Energy Efficiency in your business. Free, by invitation only. End of August. 2. Tourism-sustainability. Together with CANAECO. September. Discount for CANAECO and TCA’ s members. We are all part of the solution, we just need to learn how. Last Nov 19, more than 120 persons toasted for the titis while enjoying an incredible evening at Gaia Hotel & Reserve. Beyond a local sustainability investment, it was a special gathering for professional and personal networking between like-minded, community-oriented businesses and individuals. Everyone was invited, and even guests staying in various local hotels had a great community bonding time. May Manuel Antonio continue hosting more events like this one. Thanks to Titi Conservation Alliance for going beyond a cocktail party and reminding us that we are part of the solution, and that is possible to contribute for a good cause that will last in the destination that we all love. A part of the proceeds will be use for purchasing 2011 school supplies for young students in the affected communities of Parrita and Londres. Affected families won´t need to cover for these extra but essential expenses. By ensuring those kids will attend school next year, TCA seeks to maintain a level of education and preparation of the youth. Luckily, Manuel Antonio/ Quepos is surrounded by people who care, and a new year full of positive perspectives is approaching. We invite you to be a part of it. Join TCA or any local organization that ensures a responsible work towards local sustainability. And don´t forget, if you didn´t toast this year, add it to the list of 2011 musts. You won´t regret it and above all you´ll have a great time! For more information on Titi Conservation Alliance, please visit our website at www.monotiti.org, or contact us at info@monotiti.org at any time. Titi Conservation Alliance and INBIO – What a pair! Whether you’re a born tico or an adopted one, chances are good that you’ve heard or visited the INBIO Park. The National Biodiversity Institute of Costa Rica (INBIO) is an internationally renowned private research and management center supporting conservation and sustainable development projects. Last month, for almost 9 consecutive days, a group of 8 INBIO experts and entomologists explored the surroundings of our Rio Naranjo Biological Corridor. Together with Titi Conservation Alliance team, the group placed traps and collected biodiversity data. Such information is being used to develop the first corridor’s formal ecological report. Titi’s Conservation Alliance, members and the titis themselves are endlessly thankful to INBIO’s cooperation. And the great news is that final results are expected in October this year. Yes… we’ll keep you informed! Additionally, leaded by a new director specialized in sustainable tourism, the alliance is now working on the creation of a local purchasing cooperative to help member businesses contribute to the empowerment of local people while improving their own economies of scale. We are encouraging everyone to get involve in these efforts. Write to us about your tico artisan neighbor, local agricultural farms, regional artists… they will surely appreciate it. Or if you have a local-manufactured product for hotel/tourism supply, let’s meet! Please send all information to director@monotiti.org.